Below you will find the text of the presentation of Fr. Thomas Rosica, C.S.B. given during the 30th Anniversary celebrations of the Vatican Television Centre that took place this morning at the Foreign Press Centre in Rome. Fr. 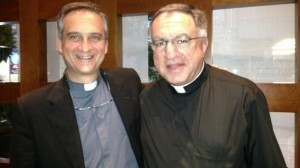 Rosica was invited to serve as moderator of the Vatican-hosted symposium to commemorate the establishment of the "Centro Televisivo Vaticano" (CTV) by Blessed Pope John Paul II back in 1983. Today Vatican Teleivision is headed by Msgr. Dario Vigano, a priest of Milan who is also professor of theology and cinema at Roman Universities. His immediately predecessor in the job was Fr. Federico, Lombardi, SJ. 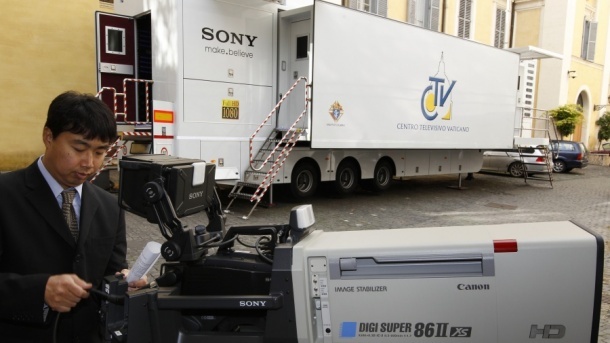 Salt and Light Television has had the privilege of working closely with the Vatican Television Centre since our own foundation ten years ago. Fr. 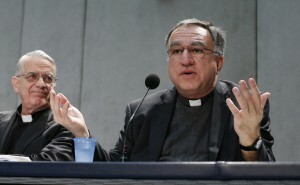 Rosica's presentation below was given in Italian this morning in Rome. The thirtieth anniversary of the Vatican Television Centre not only offers us a unique opportunity to acknowledge the significant contribution that Vatican Television has made to the Church and the world over the past thirty years, but also invites us to consider the contemporary challenges to religious television broadcasting. I would like to do this in four ways. First, I will situate religious television broadcasting in the context of biblical history. Second, I will consider the ways that authentic Catholic Television encounters the world. Thirdly, I will offer some lenses through which we can evaluate our efforts in Catholic Television today. Finally, I will highlight two powerful periods of the Vatican Television Centre’s history that have been incredible teaching moments for the world. Catholic Television: Flight or Encounter? On the northwest shore of the Dead Sea in southern Israel is the site of the Essene settlement where the famous Dead Sea Scrolls were discovered by a Bedouin shepherd boy in 1947. The scrolls removed from a cave that day and the days following would come to be recognized as the greatest manuscript treasure ever found – the first seven manuscripts of the Dead Sea Scrolls! The Essenes, an ascetical Jewish sect of the Second Temple were a somewhat fanatical religious group that existed from about 200 BC to 75 AD. They deliberately built their community in an inaccessible site. They were a group of priests and laymen pursuing a communal life of strict dedication to God. Their leader was called the “Righteous Teacher.” They viewed themselves as the only true elect of Israel who were faithful to the Law. The Essenes were convinced that the leaders and people in Jerusalem had lost their way and had become unfaithful to God. So these devout Jews fled to Qumran to clear their heads and prepare for the coming of the Messiah. The Essene writings revealed the mood of Messianic fanaticism among the Jews of the time and have disclosed much about the nature of the Essene community, their way of life and beliefs as well as many details about the Second Temple and its rituals and worship. The Qumran texts provide us with a very good background picture of one aspect of the religious world into which Jesus came. 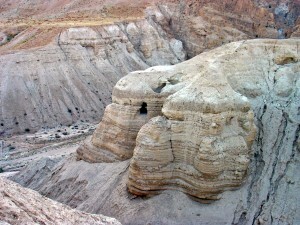 Qumran offers the Church one paradigm of how to deal with the world, with news, and with media and communications. There are some people in the Church today who feel very much like the leaders of the Essene community – who view themselves as the only true elect of the Church, the only remaining faithful who have not lost their way! In their mind, the only way to deal with the world is to flee from it, and construct their community in inaccessible sites like that of the Dead Sea… to build a hermetically sealed fortress that keeps the outside world outside! Communications becomes an internal affair, preaching to the restricted gallery of the saved, the clean and the non-problematic people. Experience has proven to me that the Qumran method is not the way of dealing with the world today! Rather than fleeing the confusion and ambiguity of our age, and hiding in the nostalgia of a past that is now buried in the heart of God, some of us must remain in the city, in the present, in the thick of things, offering the world the unambiguous message of the Gospel, the teaching of the Church, a ray of hope, and a dose of badly needed joy. And we have to do this work on different media platforms, simultaneously! Jesus did not make his home base on the shores of the Dead Sea, but rather in cosmopolitan Capernaum, on the shores of the Sea of Galilee. In that little fishing village strategically located on the extension of the Via Maris, he had regular dealings with many people including tax collectors, and a Roman centurion. He was very much at home in Capernaum, not in Jerusalem nor at the Dead Sea. Though clearly not a politician, Jesus had a keen sense of politics and rarely turned down an invitation to dinner. Jesus bonded himself with the unclean, the sick and dying, with sinners, and those living on the fringes of society. He befriended sinners and the wretched of his times- never condoning their behavior, but inviting them to an alternative lifestyle. He teaches us that by "being with people" he also heals, restores, renews and reconciles broken humanity. Jesus asked his followers to go to the peripheries – to the ends of the earth, not just to places where they felt comfortable. He always spoke in a language that people understood and used the media that people found accessible. He was the ultimate communicator. His incarnation was God’s greatest communication with humankind. His challenge remains the same to us today. To do this effectively, we must engage with the traditional media and new media, whether as communicator or consumer. The most effective way we can use the media is by bearing true witness to the message we seek to deliver. The strength of our message and our stories lie in the authenticity and transparency with which they are presented. Catholic television today must avoid the temptation to run to extremes in times of crisis like our own. There is a temptation to become fundamentalist and so rigid in doctrine and life that one becomes enclosed, like a hidden garden, or walled castle, so that nobody hears the word except those within. There is also the temptation to run to the other extreme and become so conformed to the ways and values of the world that sound Church teaching and the truth of the Gospel entrusted to us, will be diluted, distorted and lose its savor. The future of religious broadcasting lies not in demanding more dedicated religious programming but in creating programmes that inform, educate and entertain; this in fact may be a better way to communicate faith to a secular society that literally switches off when religion is presented as education and instruction. The task of Church communicators, journalists and broadcasters is to keep working to develop and use new media to communicate the Gospel and promote a culture of dialogue. A single medium is no longer enough to capture the full attention of the audience. The key to successful religious broadcasting is the multi-platform approach. New media also includes the viral world! Video clips that go viral can reach as many people if not more than a TV programme. Churches need to be aware of these developments because they are low cost and highly effective at reaching those segmented audiences. The search for meaning is the most powerful force in the world. What we need to do is show the culture that we're not against it, that we have a compelling story, and that the story can change peoples’ circumstances. When that happens, people will listen. We must avoid providing what are portrayed as easy and simplistic answers for every question addressed to us. Often the right answers are difficult. In my work at Salt and Light Television Network in Canada over the past decade, I have had to quickly learn about broadcast technology, and all that goes into making a good film. One important aspect of television is the intricate camera work “behind the scenes.” The close up and wide-angle camera shots make all the difference in filming and telling a story. In producing our programs or documentaries at Salt and Light Television, if we use too many close-ups, we lose sight of the bigger picture. If we overuse the wide-angle lens without attention to the particulars, it doesn’t make for good television. Good television combines the wide-angle or panoramic shots, the intermediate views of the surface, and finally the close-ups that offer attention to detail and often provide necessary depth for understanding the whole picture. Let us consider these three lenses through which we might evaluate our work in Catholic television broadcasting and Catholic media: 1) the wide-angle lens that looks at the origins and foundations of the Church; 2) an intermediate lens that focuses in on the ideologies at work in the Church, and 3) a zoom lens to sharpen our hope, the great manifestation of the Holy Spirit to the Church. We begin with the origin and foundation of the Church at Pentecost. Pentecost is a time of transition from that first mysterious joy and terror of the events around Christ to the forming of a church that will enable his vision and joy to stand the test of time and history. At the first Pentecost, Christians received the Holy Spirit — the universal principle of Christianity — and their eyes were opened to the universal import of the Christian truth as they encountered non-Jews who received the Holy Spirit just as they had done. From the wide-angle view of the Church, let us take a closer look at our current ecclesial realities. Perhaps we are frozen in categories of left and right; traditional vs. avant-garde; male vs. female; hierarchical vs. lay-led, or prophetic vs. static. Our inter-ecclesial and inter-community fixations and polarizations on all sides of the ecclesial spectrum can distract us from addressing with requisite depth and discernment the issues facing us today. The grumblings, discontent, cynicism, fatigue, frustration, unfair labeling and pigeonholing of others; the lack of charity and hope can rise to fever pitch, and keep us blinded to a new generation of young people who might be asking serious questions about Jesus, discipleship, the Church, and media ministry. The next generation does not see the Church as the terrain where ideological battles are waged and very frequently lost. Now let us zoom in on hope, a true manifestation of the Spirit at Pentecost. Is it not true that many of us in the Church today feel like we are caught in a flash flood that is unexpected, powerful, destructive and filled with despair? The media exerts a powerful influence on the thinking, the attitudes and the faith of people. The flash flood bears down with immense force on all of us. Some view our present situation with great pessimism and grow disheartened, depressed, and even cynical. Others don't want to admit what is happening and go whistling in the dark, clinging to the illusion that things definitively past can be recovered and the claims and facts of the present ignored. For the world of sound bites, hope usually means that we make ourselves believe that everything is going to turn out all right. We use the word hope lightly and cheaply. This is not the hope of Christians. We must be icons of hope, a people with a new vision, a people that learn to see the world through the lenses of Christ, the Spirit, and the Church. We cannot weigh the life of faith and judge the vitality of the Church solely on the basis of demographical or sociological indicators, numbers, polls, and outside statistics, as helpful as they may be. Unless we can go beyond our little worlds and traditional spheres of influence, we will remain impoverished. The Holy Spirit invites us to rediscover the depth, beauty and vastness of the Church’s mission. Those of us entrusted with instruments like television and radio have the obligation to present these images to the world. On this thirtieth anniversary, we must not forget that it was Pope John Paul II himself, who decided in 1983 to establish the Vatican Television Centre (CTV) alongside Vatican Radio, which was founded by Pius XI in 1931. I would like to consider two privileged teaching moments of recent Church history when the Vatican Television Centre played an extraordinary role in inviting the world into the Church and bringing the Church into the modern world. The first great moment took place in early 2005 when the world was able to witness the leave-taking of Blessed John Paul II. Through those heart-wrenching moments during his final weeks on earth. John Paul II communicated through spontaneous, symbolic actions that were often more eloquent than some of his speeches, homilies and encyclicals - especially his finally moments on the world stage. Those actions were often powerful symbols. The word 'symbol' comes from the Greek word 'symbolein' – 'to bring together'; it's the opposite of the Greek word 'diabolein,' 'to break apart, to divide' – the origin of our word ‘diabolical.’ Symbolic actions help to bring people together in peace and in love. Up to the moment of his death – and even after, Pope John Paul II was bringing people together in peace and in love. That was communication at the service of truth. During the death and funeral of Pope John Paul II, CTV earned world acclaim for the speed with which it captured and broadcast the images of the various funeral rites. In addition to Pope John Paul II himself who planned out the ceremonies, the world owes a debt of gratitude to Fr. Federico Lombardi, SJ, then director of CTV, and Archbishop Piero Marini, then Papal Master of Ceremonies for their carefully coordinated work in bringing us the magnificent ceremonies. Who can forget the carefully orchestrated removal of the Holy Father’s body from the Sala Clementina to the Basilica of St. Peter, down staircases, out the Bronze Door and through St. Peter’s Square and into the Vatican basilica? The moving telecast was the first time that television cameras were able to follow, in its entirety, the unfolding of the rites that take place around the pope's body, broadcasting these to the world in real time. Major international television networks that transmit the news around the clock, remained connected with the Vatican for days on end. 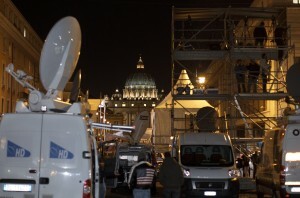 The television cameras installed in St. Peter’s for three solid days – 72 hours - showed the world a stream of humanity passing the Pontiff’s body. Those cameras were silent witnesses to an extraordinary ecclesial event. 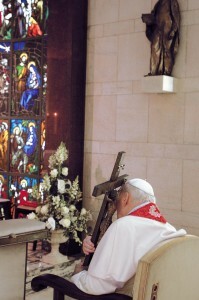 The stunning images of John Paul II’s funeral mass taught a lesson to the world about the meaning of resurrection and life with the cypress coffin placed in the centre of the altar area, the flickering paschal candle, and the pages of the book of the Gospels fluttering in the gusts of wind. 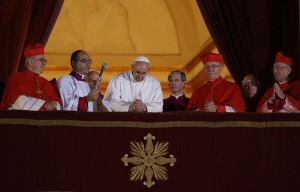 For the conclave of 2005, CTV invited the world into Vatican and allowed humanity to see the magnificent procession of Cardinals entering the Sistine Chapel to undertake their most significant responsibility. [In 1978, the year of the two conclaves, it was RAI that covered both the events with three cameras: one in the Pauline Chapel, one in the Sala Regia, and one in the Sistine Chapel.] In 2005, the most famous chimney in the world was watched without interruption by one of CTV's cameras, placed ten meters away. That image remained fixed in a small box on television screens throughout the world. From 2005 until February 2013, CTV grew significantly in technology and creative transmission methods, and its progress was mightily evident in the weeks to come. February 11, 2013 did not only shift the plates of the earth for the Church, but marked a seismic shift in my own life. Early that morning in Rome, Benedict XVI resigned and caught the world and the Church off guard. Several days later, I joined the staff of the Holy See Press Office at the request of Fr. 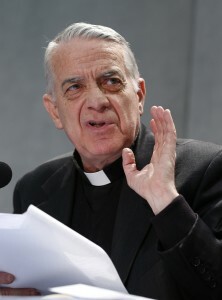 Federico Lombardi, SJ, to be part of an adventure that included a Papal Resignation, the Sede Vacante or Interregnum, a Conclave taking place without the atmosphere of a Papal funeral, and the surprise election of the first pope from the Americas, not just any pope, but a Jesuit pope; the first modern Pope to have been ordained to the priesthood after the Second Vatican Council. One of the most poignant moments of my Roman sojourn took place on February 28, the last day of Benedict’s pontificate. His departure from the Apostolic Palace and the Vatican captured the heart and mind of the world. Once again it was the Vatican Television Centre that brought these historic moments to the world. Benedict’s touching farewell from his co-workers on that crisp, Italian afternoon, the brief helicopter flight to Castel Gandolfo, his final words as Pope, reminding us that he would become “a pilgrim” in this final stage of his life, touched us deeply. There were no dry eyes in Rome that night. The whole departure reminded me of that emotional moment in the Acts of the Apostles (chapter 20) when Paul took leave of the elders at Ephesus. Once the Pontificate ended, our work in the Holy See Press Office multiplied in spades! Over 6000 journalists descended upon Rome and they were hungry for information. Together with Fr. Federico Lombardi, SJ, and Msgr. Gil Tamayo from Spain, we led the daily press briefings for hundreds of accredited journalists from every corner of the globe. Our colleagues nicknamed us: “the Trinity!” The Vatican strategy of spreading the table of information began to bear fruit. And we did this before the television cameras of the world. I was asked to handle media requests in English and thus worked 18-hour days with television, print and radio media from every corner of the globe. I lost count after doing 165 television and radio interviews with every possible network you can imagine… first in English, then French, Spanish, Italian, and German. 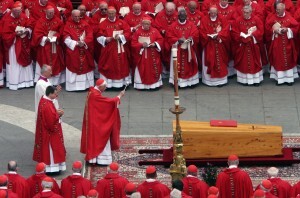 When the College of Cardinals finally entered into the conclave on Tuesday, March 12, the excitement and expectation were palpable. For the opening rites of the Papal conclave, Fr. Lombardi invited me to be inside the Sistine chapel for the majestic procession, solemn ritual, prayer and oath taking of the cardinals. When we entered, several things struck me deeply in that hallowed space. When I was a boy, I used to watch movies on TV, about everything that happened here. Yet on that day, watching Cardinals processing slowly up the specially constructed ramp, I realized that this was not a movie or a political election campaign, but a deeply moving, spiritual experience. I had chills going up my spine as I heard the Sistine Choir chanting the Litany of the Saints and the “Veni Creator.” I looked at the solemn faces of those Cardinals, many of whom I knew, and saw, not just men in scarlet robes, but their countries – and I imagined their people back home praying for them. I heard their voices resound in the chapel as each Cardinal placed his hand on the book of the Gospel and pronounced the oath in accented Latin, standing before Michaelangelo’s stunning wall of redemption and under the story of creation on the Sistine ceiling. One of their lives would be radically changed in that room. The words “Extra omnes” had a direct impact on me, since I was one of the last people to be ushered out of the Sistine Chapel before the voting began. Once again the cameras of CTV brought these moments to the entire world. I will never forget the experience of that cold, rainy Wednesday evening of March 13, when the white smoke appeared. With the “Habemus Papam” came the name of a stranger, and outsider, who instantly won over the crowd in the Piazza and the entire world with the words, “Fratelli e Sorelle, buona sera!” (Brothers and sisters, good evening!) Who would believe a pontificate beginning with those simple, common words? Never in my wild imaginings did I expect a Pope to be called Francis! Nor could I comprehend the scene of over one hundred thousand cheering people suddenly become still and silent as Papa Franceso bowed and asked them to pray for him and pray over him. It was the most moving moment I have ever experienced at a Vatican event. People are drawn to the Church in order to find the spiritual purpose for which they often laboriously search. They are not Godless and they wish to learn from our wisdom and our ability to tell the story, with words and more often with images. This contemporary search defines our work in the broadcast media, both Catholic and secular. Handled with wisdom, intelligence and creativity, television, especially can truly be the greatest portal to the Church in the 21st century. However, the most significant challenge we face in doing this is neither technical nor financial; it is existential. It is also the most important challenge facing the Catholic media at large. In fact, if the Catholic media are to have any reasonable hope of meeting the serious technical and financial challenges we face, then we must first answer more fundamental questions: Who are we? Do we love the Church? What lenses do we wear as we look at the Church? What face of the Church are we offering the world? For four solid weeks during Lent 2003, Vatican Television provided for the world extraordinary moments of education, catechesis, evangelization and beauty. This reality we call Catholicism has weathered many storms, and withstood the fury of the gates of hell. It is a story about real people, real things and seismic changes that happened to them. People who staked their lives, and continue to do so, not on fables and fantasies, but on what they came to understand as the truth, the bedrock for shepherds named Angelo Roncalli, Giovanni Battista Montini, Albino Luciani, Karol Wojtyla, Joseph Ratzinger and Jorge Mario Bergoglio, - the popes of my lifetime, whose lives and names were radically changed in the Sistine Chapel. 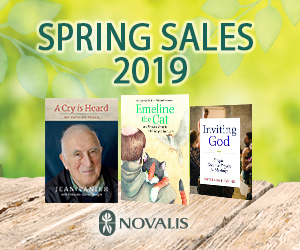 It is that same truth that we tried to serve those unforgettable Lenten days as we told the world an ancient, at times incredible story that continues to excite and entice the whole world. “The service of ecclesial communication that takes place in Rome always has a vital need of collaboration with the various regions of the world. It is only locally that one can establish a Catholic television network that responds well to the hopes of the population of a particular region, because the television network knows very well the languages, problems and expectations of the people of a particular area. The network can present witnesses of the faith, people from the world of culture, pastors and bishops who can be in direct contact with the public through a particular television network in their country. On the other hand it is from Rome that we must make available to local television networks images, testimonies, the voice of the Pope and of his close collaborators who work with him at the centre of the Church; information from the various parts of the universal Church that meet in Rome during Synods of Bishops, canonizations, great events that have relevance for the whole world. 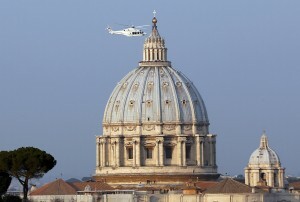 We must send these images and information on Papal visits throughout the world. Such images make known and build up the unity of the international community that we call Church.